On the one hand, one of the ideas I had for the site specific art project – a jacket patch – gave me the chance to develop a bit an idea I’ve had for a while. Namely, a central back panel with a snarling honey badger. I took advantage of the project to combine it with putting this idea into motion. 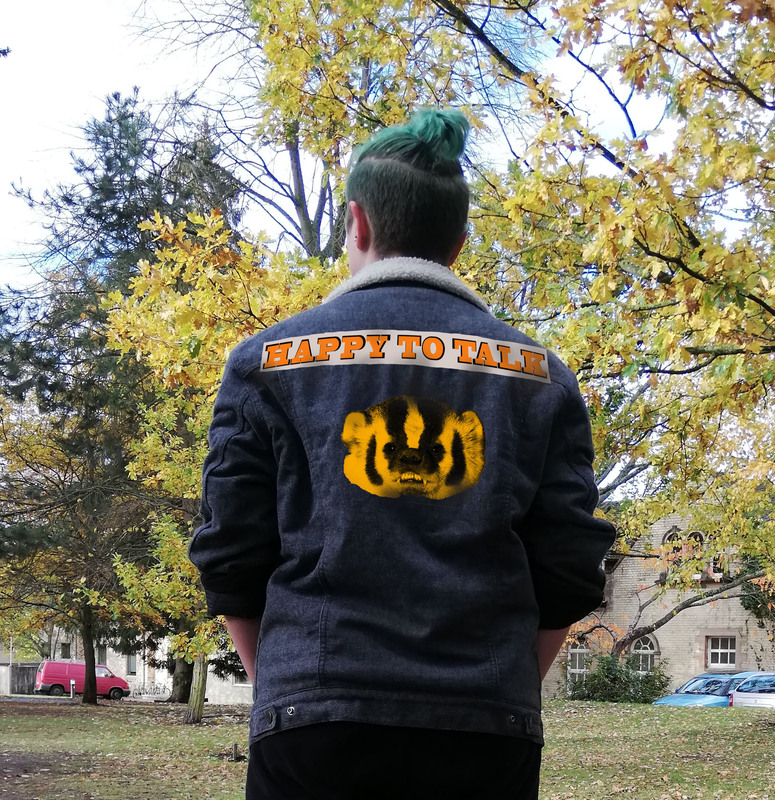 On the other hand, what I really would have liked to do would have been to actually sew the ‘HAPPY TO TALK’ and badger in felt layers onto a leather (or maybe dark denim) jacket, to fulfill the punk image. Then the piece would’ve been the jacket itself. That would’ve cost me way more money and time than available, so I had to turn to other methods, photoshopping my ideas on instead. In using other avenues, I ended up exploring the bitmapping of an image that I learned in screenprinting earlier this week, doing a bunch of invaluable photoshop practice, and also managed to render a few different variations on the theme (different bitmap, backed lettering) – something I definitely wouldn’t have been able to do in the full-fledged textile medium. Also, now that I’ve been initiated into screen printing, I’ve got the option to explore printing the patches (would work especially with the badger I think, but the text I have a v strong mental image of it layered felt or similar) rather than sewing them – which would be a quicker path to a physical rendition (and reproducible too). Although, even down the quicker photoshop avenue I still found myself coming up against time constraints – for example, I would like to explore some different fonts and colours. And I’m still not settled on the ‘diagrammatic presentation’ of how I would want this piece displayed in a gallery. Maybe both in situ photos *and* the stitched jacket? Would the presence of the jacket take the life out of the site-specific photos, or would it make them more tangible, accessible, present ?